As the managing partner of a proprietary trading firm in NYC, I study traders succeeding. This retail trader is succeeding! I reached out and asked him a few questions (in bold), hoping to learn from his success. Below are his answers. Who are you and where are you from? Why did you get started in trading? I’m a retail trader from Sydney (@_jpark89 on Twitter) and videos such as “How to make $1000 in 10 minutes,” “How to buy stocks before they spike 200%,“ “How to turn $1000 into $10,000,” were my introduction to the trading world. Since then I made some easy money (100% luck), blew up a couple accounts, started over with a $600 account (third time’s a charm) and recently crossed $100,000 in overall profits. What obstacles have you overcome to succeed? Why have you been successful? Trading wise, I’ve had to deal with the same obstacles most small retail traders face when starting out. Inadequate guidance, small account, high commissions, lack of borrows, you name it. I think I’ve been successful because I didn’t use these “obstacles” as an excuse for why I couldn’t make it and put in the necessary time and effort in order to succeed. 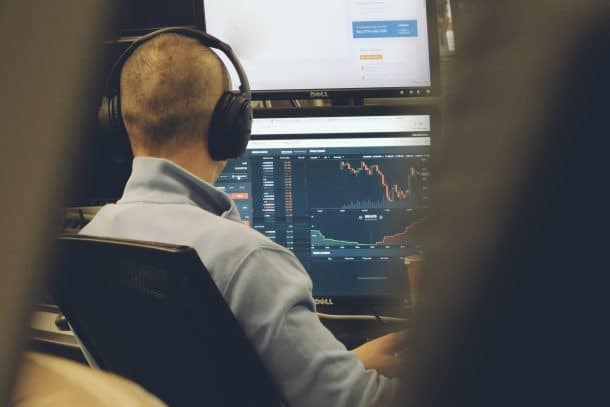 I worked to support myself financially, I traded or at least watched the market action from 9:30am to 4pm and did the required work outside of market hours in order to improve (which in the beginning, I didn’t even know how to do). What mistakes are underperforming traders making that you are not? They equate positive P&L to good trading. Sure, who in their right mind would prefer to lose money over making money? Let’s say for example this week, Monday through Thursday Trader A made $100/day and lost $100 on Friday. Does that mean Friday was Trader A’s worst trading day? Not necessarily. In my opinion, trading is a game of probabilities and risk management. The best you can do is enter trades when the odds are in your favor and manage your risk accordingly. There is no strategy out there that has a 100% win rate (except the guys who trade on a laptop by the beach with bad WiFi) and therefore you will have days where you do everything right and lose money, just as some days you will make horrible decisions and walk away with a profit. The focus should be on something you have full control over, such as solid trading practices, whatever that may mean to you. If your strategy has shown edge over time, the only thing you need to worry about is the consistent execution of your plan and P&L will take care of itself. Who is likely to be the better trader; the guy who made $10,000 in his first and only trade or the guy who made an average of $100/day over 100 days? It may be beneficial to learn setups and ideas from others especially if you are new. However, somewhere down the road I think it’s absolutely necessary to have your own take or variation on those setups and make it your own. Long breakouts, short failed breakouts, long at support, shorting a parabolic move, shorting a daily chart breakdown on earnings miss and lowered guidance, there are literally a million different ways to make money in the market and you only really need to master one trade to be on your path to consistently profitable. Generating your own additional reasons for setups that make sense to you as well as the criteria for entries and exits are, in my opinion, paramount to developing conviction in your trades. Who has influenced your success and how? I have learned so much from many different people on Twitter but these are the people who have had the biggest impact on my trading. 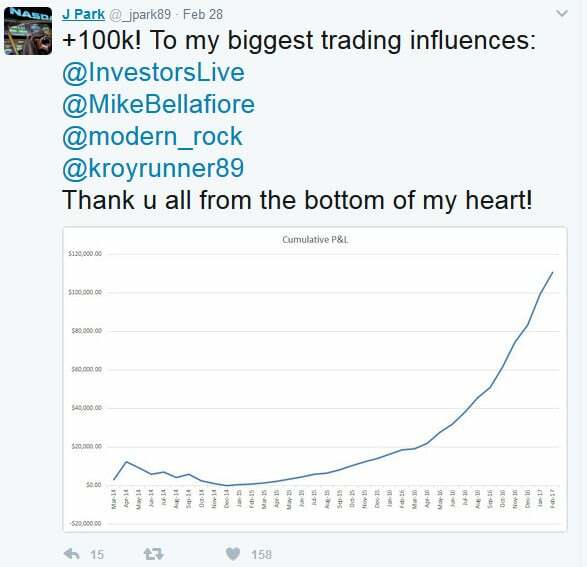 @modern_rock – Early in my trading career, he opened my eyes to not only what was possible in terms of P&L, but also the level of consistency that was achievable. Bao taught me the importance of singles (not looking for home runs on every trade) and consistency. 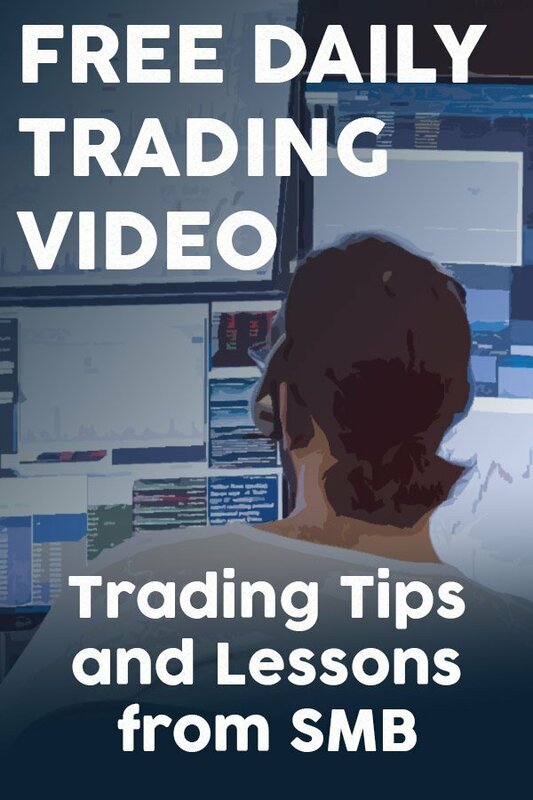 I highly recommend checking out @mrockrulez where he shares his own personal trading rules and the lessons he has learned along the way. @kroyrunner89 – I learned the basics of Level 2 analysis on OTC stocks from Tim as well as a more methodical approach to finding my own setups through building spreadsheets and collecting statistics. Openly talks about his biggest losses and his plan going forward to overcome these bumps, which I have found to be very useful. @MikeBellafiore – The author of my two favorite trading books, One Good Trade and The PlayBook. I came across his books when I was already somewhat of a consistently profitable trader but they were instrumental in helping me break out of the $100-200/day channel. They gave me a more structured plan on how to progress with increasing risk through a few basic concepts and also provided me with a better way to review my trades. Aside from the trading aspect of the book, the “You can be better tomorrow, than you are today,” mentality was my biggest takeaway from the books. Size has always been something I’ve struggled with, but I’m trying to push outside my comfort zone as often as I can, while still staying in control emotionally. Sometimes this may mean taking on just $50 of extra risk on a trade, but I’ve learned that this can add up quick over time if done consistently. I would love to get to a stage where I’m comfortable risking $1000 on a trade in the next few months and perhaps $2000-3000, by the end of the year. Around 80% of my trades are on micro/small cap momentum stocks, typically under $20. I’m trying to get more familiar with anything that’s not my core niche. Sharing my progress on Twitter has allowed me to connect with many different traders of all levels. I believe this has helped me progress tremendously and would like to continue learning from traders of all different skill levels. Study the traders succeeding. They will help your trading game!